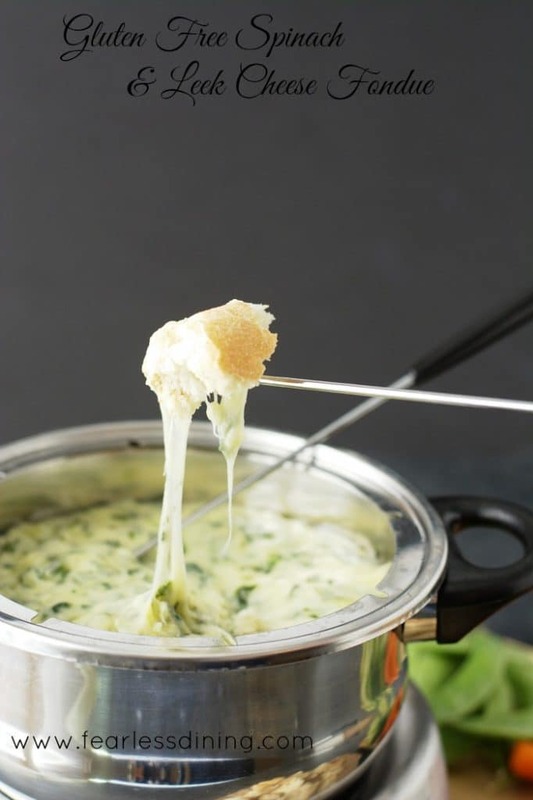 This cheesy gluten free spinach cheese fondue is quick and easy to make for a get-together. The leeks caramelize, which add a whole new level of flavor to this cheese dip recipe. This week is all about easy holiday entertaining. I feel like the holidays are so hectic and busy; it makes a huge difference to me to have appetizer recipes that are quick and easy to put together. It lessens my stress load, which leaves me a much happier person. Have you ever tried fondue? It is a hot creamy cheese dip that originated in Switzerland. You can dip all sorts of delicious things into the hot cheese like breads and vegetables. Do you often have friends who drop by to say hello during the holidays? We do and we cherish this quality time with our friends. Having ingredients on hand to make appetizers helps keep me prepared for any occasion. I thrive on making delicious appetizers that everyone at the party can enjoy. If you have been reading my blog for a while, you know I am all about easy recipes. This easy fondue recipe is no exception! You can dip vegetables or even this delicious gluten free baguette by Schar that I found at our local grocery store. Just bake it for 5-8 minutes and it gives you that amazing crispy outside, something that those who are gluten free often miss. I also want to put an unsolicited plug for this fondue pot. Mine has lasted for years. My favorite feature is that I can adjust the temperature so I can use it for meats, cheese, or a creamy chocolate dessert fondue. If you need more yummy addictive dips for your party, you will want to make this Gluten Free Cheese Fondue from My Gluten Free Kitchen. Chop cheese into cubes and toss with the gluten free flour blend to coat. In a pan, sautee the spinach, leeks, and garlic with a tablespoon of butter. In a sauce pan, add cheese, butter, wine and cooked vegetables. Cook on low heat, stirring frequently. Cook until all of the cheese is melted. Serve warm in fondue pot with vegetables and bread. Go here for more delicious gluten free appetizer recipes from Fearless Dining. These Delicata Squash Cheddar Fritters are another great cheesy appetizer! We made this for New Year’s Eve and it was fantastic! Honestly the best cheese fondue I’ve even made. Notes: there is no garlic listed in your ingredient list (luckily I had some on hand), you say “shredded” cheese in the ingredient list but cubed in the instructions (I used cubed), and the instructions say to add wine in both steps 4 and 5. I added it in 4 (used cooking wine but think dry table white might be even better). Ate with gluten free baguette, broccoli, and cauliflower. I repeat: YUM! I am so glad you liked this recipe Danika. Thank you for pointing out the missing garlic. I don’t know how I missed adding that. I checked back in my notes and added that in. I also added shredded or cubed. Have a wonderful New Year :-). What fun and festive holiday party food Sandi! This fondue sounds amazing. With spinach and leek this must be so tasty!! When I was growing up my mom had a fondue pot. We loved it! How do I not remember to get one? I actually clicked on your link but it didn’t work. Let me know if you have a link i can use I may order my own pot. Love the idea of the adjustable temperature. Mom’s was rather difficult to heat properly if memory serves. This recipe looks so fun for appetizers at a party! This fondue pot has been the best so far…plus it comes with color coded forks so my kids don’t fight LOL. This looks fabulous! And it reminds me of when we used to have people over for fondue parties. It was so much fun! Wee need to try that again! Thanks for the recipe! That ooey, gooey cheese looks amazing! I love the addition of leeks in your fondue! What a delicious idea. I haven’t had fondue in ages, but what a great idea to add spinach in to it. I am going to have to try that very soon. I love fondue, sweet and savory. This one looks so inviting and tasty! Oh my goodness gracious me this is absolute cheese heaven! I’m salivating looking at your beautiful ooey gooey photos! I have to check out this fondue pot as I’ve always wanted one – thanks for the recommendation. This is a great and delicious way to enjoy veggies for sure! My hubby would love this! I love fondue and your recipes sounds so savory and delicious! Like you I like it when you slow down to enjoy the meal and those around you. Perfect! I think fondue is such a fun group activity and way to share a meal. Throwing in spinach and leeks also makes it even more interesting than just a big vat of cheese! Yes…Cheese, Please. This recipe sounds amazing. I’ll have to check into the Gluten Free flour blend. I’m in love with the idea of adding veggies to fondue! There aren’t many things I love more than warm melted cheese and I think I could eat way too much of this. Lovely recipe.